I was able to tour Hunter College and see the graduate students' lab set-up, as well as the NMR facilities, single crystal X-ray diffraction detector (XRD), and the computer lab. The facilities were extensive and extremely interesting to see. I was even allowed to personally try a get a single crystal of simple table sugar onto the 'hook' that is used to place the crystal in the line of the X-rays for the XRD. The hook is so tiny that even for the tiniest of grains of sugar the process felt like trying to catch an elephant with a butterfly net. Fortunately after some expert crystal-wrestling from the experienced post-doc Ben we managed to get it on the hook, and got to see the XRD in action. I also got to do a little bit of radiochemistry with the reagents that Sam was working with. The general idea of his research is that if one were to attach something faintly radioactive (in that it emits a low does of radiation) to an anti-body that would accumulate around cancer cells, eventually there would be enough radiation around the tumor to kill it without harming the rest of the body. I got the chance to repeat Sam's experiment superficially and characterize the product with one of the lab instruments, which gave me a taste of Real Science. The last day I was in New York I was graciously invited to tour the Ketterin Center, where Sam does a lot of his work. His laboratory leader was kind enough to explain to me some of the papers he was working on and show me the various labs and instruments such as a mouse-sized PET scanner (which can be used to detect tumors as long as they've been tagged with a radioisotope). This was my first view of an actual professional laboratory and it was extremely helpful for me to see the environment in which serious scientists work. 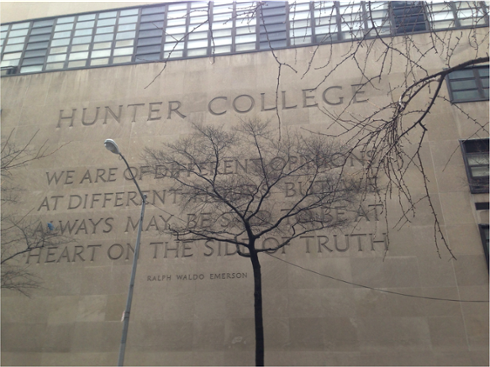 Overall, being able to experience a couple of days in the life of a grad student and see the facilities and opportunities at Hunter was invaluable, and I really appreciate the work that Sam, Brooke Hunter of the Center for Life Beyond Reed, and everyone else at Hunter College did to ensure that I could have this experience.